According to the calendar, as well as the sight of birds who'd left us for the season, it's time to lower the old porch swing and set a spell. 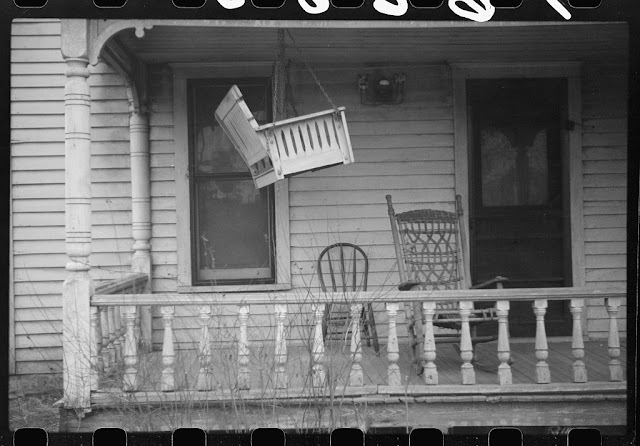 As you may have guessed, this post is about one of those favorite pieces of porch furniture - the swing, and the people who use them. The front porch is of American origin from 19th mid-century, but it's most glorious years were those from the 1880's until the 1940's. These were the years of new neighborhoods with shortened work days where people enjoyed sitting out and watching the world go by, if only for a few hours of the evening. 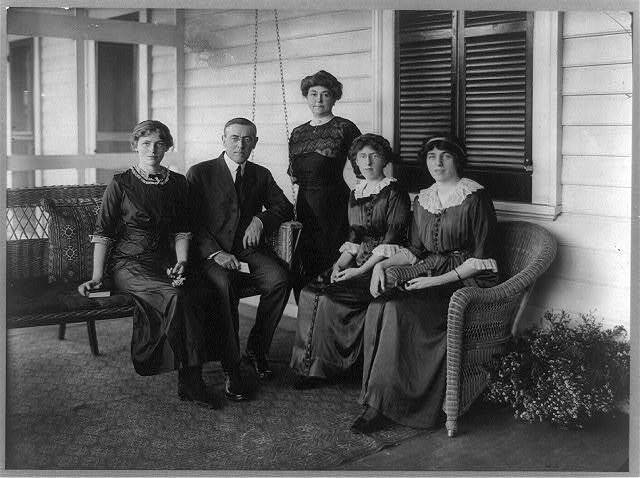 In this first image, soon-to-be-president Woodrow Wilson shares family time with his wife on the swing, while his three daughters sit and stand nearby. Although probably staged, it shows a typical front porch setting with the bonus of 1912 fashion. 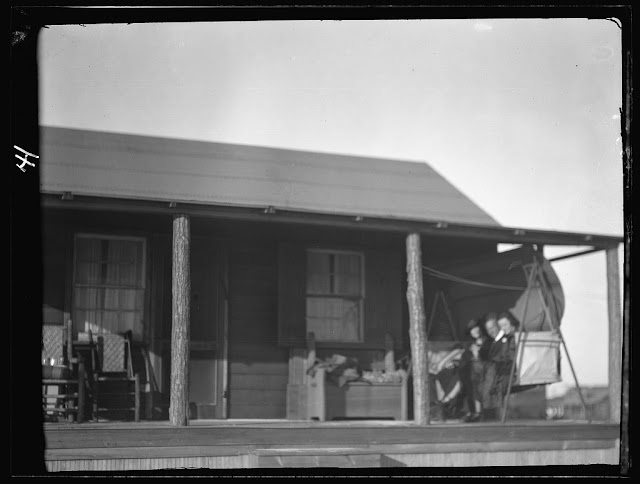 A similar setting is that of Arnold Genthe and two women friends sharing a porch swing. The image is slightly blurry, yet comical because Arnold Genthe was a successful photographer and this time he is the object of the image and not the creator of it. I wonder what he thought when the finished product emerged from the chemicals and wash of his darkroom. The moment I saw this next image, my heart reacted to the despair in the woman's face. The year is 1912 and a blanket emblazoned with White Star Line covers her lap. Charlotte Collyer and her daughter are survivors of the Titanic sinking. Husband and father, Harvey Collyer, was carrying their life savings of $5,000 when the ship went down. 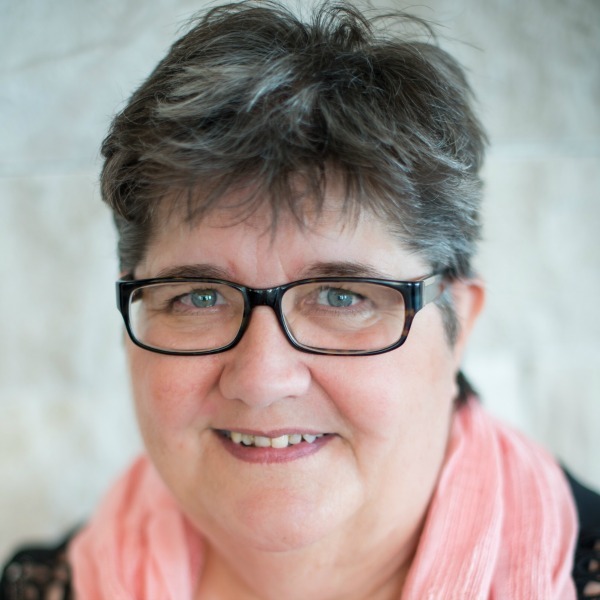 Along with losing all the money needed for their new fruit farm in Idaho, Charlotte and her daughter lost all their possessions which had been stored in the hold of the ship. They were left destitute. Charlotte pushed on to Idaho to fulfill her husband's dream, selling her story of survival to make ends meet, and we are left with this image of her shock and grief. 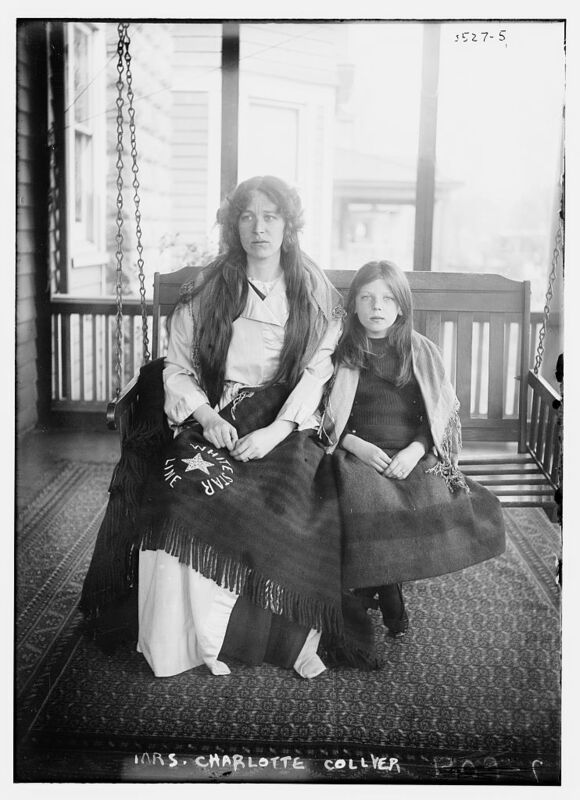 Mrs. Charlotte Collyer with her daughter Marjorie, 1912. 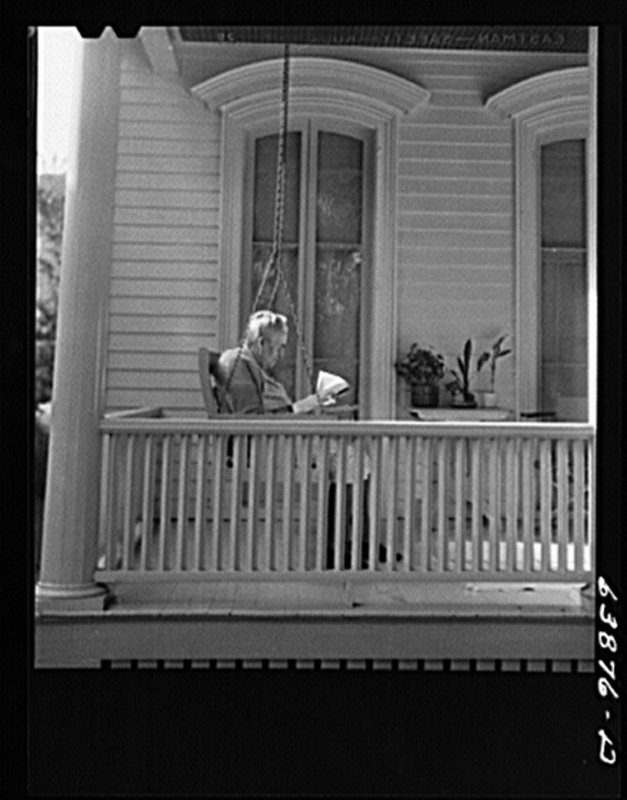 Library of Congress Prints and Photographs Division Washington, D.C.
A porch swing with a gentle summer breeze can be a great place to read and that's exactly what this mother and child are doing on their front porch at Sabine Farms in Marshall, Texas. The caption accompanying this photo brings attention to the garden in the background as well as the book. 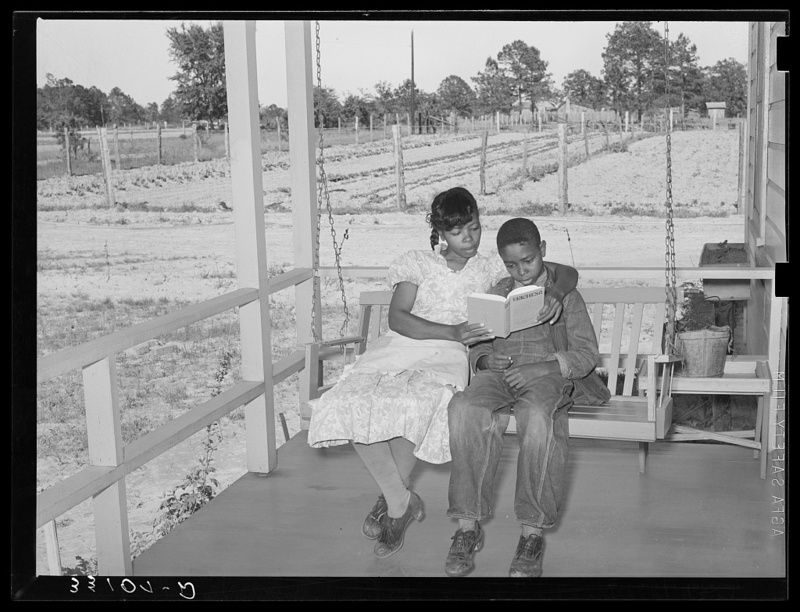 Wife of FSA (Farm Security Administration) client reading book to her son on swing on her front porch. Notice garden in background and title of book. Sabine Farms, Marshall, Texas, 1939. Library of Congress Prints and Photographs Division Washington, D.C.
Of course, reading is enjoyed by all ages whether it's a book, newspaper or letter. Some people can't read on a moving swing as they get motion sickness if they look down, but that's the beauty of a porch swing...it can be as still as the person sitting on it wants it to be. Or, for the more adventurous, a slight push of a toe can glide it into motion. Front porch, Elgin, Illinois, 1941. Library of Congress Prints and Photographs Division Washington, D.C. Sitting on a porch swing is a lovely place to be, don't you think? The 1920 Montgomery Ward catalogue shows 2 distinct styles of porch swings and one is almost double the price as the other. But is it due to comfort or beauty? Please share your memories of a porch swing, if have some, and if you don't, any thoughts on the subject? I love porches, yet only one of the houses we have ever owned had one! In those three glorious years one of the moments I treasured was sitting out there during a rain storm. It didn't have a porch swing, but it's more about the porch itself for me. Great post! I know, eh. And your comment reminded me of a weekend visit long ago while in the British Columbia interior where we stayed in a 1930's bungalow with a screened-in-porch. It was a heady feeling sitting in the dry porch, listening to the varying sounds of rain falling on different textured surfaces. Well, it was dry as long as I stayed 2 feet from the blowing wind side. A stack of newspapers sat nearby, one corner fluttering, but I didn't want to read, just close my eyes and absorb the sounds and smells of that rainy afternoon. I love porch swings. We had one at the first house we bought, but then we moved to a house that had a tiny porch. Now we've just moved again, and we have a large deck which actually has hooks for a porch swing. It's on my list of things to buy. Great news, Vickie. And with porch swings coming back in style there are more choices of materials used, whether wood or metal. Probably even heavy duty plastic too, although I tend to think that wood weathers the best, especially for looks. Intriguing post - one that makes me want a porch swing. But I'll have to get a porch first. I wonder if Genthe deliberately blurred identities in that photo. Curious! Yikes, what a thought! I'm so very glad you're still here to share that memory with us, scary that it is. Possibly, swinging during a thunderstorm would be soothing in a way because the sound would be loud...soft...loud...soft... sort of like a low swoosh that evens out the sharp sounds and mutes them. I'm only guessing because I've never swung during a storm - yet. Thank you for sharing, Melissa. Anita, thank you for sharing this post and the pictures...I love the pictures. When my sister, brother and I were young and visited my grandparents in Virginia (we live in Maryland so we didn't see them often), we loved to sit on the covered front porch and swing on the porch swing while talking, reading, listening to/watching the rain, having a cold glass of soda or water and having a fun time. Wonderful memories. Now I have a swing on my front porch (uncovered though so can't sit on it in the rain) and I love to sit there while reading a good book, watching the birds at the feeders and watching the sun set, enjoying God's beautiful creation. As Anne Shirley would say, we're kindred spirits, Mrs. Tina. When I step outside my front door I'm on a raised cement slab about 18" high. The previous owners left holes for a railing to be installed, but never put one up, possibly because the pitch of the house roof doesn't allow for a covered porch roof unless major construction is undertaken. We haven't attempted it because the slab isn't very wide - certainly not wide enough for a porch swing. So I sit at my cast iron bistro set to watch the birds at my feeders and enjoy God's wonders like you do. But I have my memories of other swings and dream of the day I'll have another. I'm very glad you've shared that a swing is back in your life. Perhaps someday you'll be blessed with a cover for your porch as well. All in God's timing. I love swinging and you can beat a big ole porch. Thank you for sharing your great post! I enjoyed our porch swing growing up. I miss not having a porch large enough for one now. Thanks for speaking up, Marilyn. Your comment joins the others in remembering something special. Hopefully we'll enjoy another period of front porch swings with you leading the bunch. I recently completed the refinishing of a porch swing that was built in 1895 by my Great-grandfather using a Montgomery Ward hardware kit. It came down to me through family and has quite the storied past. At one point my Uncle stored it for my Grandmother and after several years of her not using it he sold it. Of course the next year she was ready to use it again and Uncle had no idea to whom it had been sold. He had to go door to door through several hollers in south-eastern Kentucky before he found the man who had purchased it then had to pay substantially more than he had originally received for it in order to buy it back. It took him months to find it for her. It is in very good shape but unfortunately I have no one interested in taking it when I am gone, so I'm a quite sad that the history and stories will end with me. Still, I sit on it during the evenings now and think about my ancestors and truly enjoy owning it. I feel the love your family shares in your comment. Your uncle would not have gone through the time, trouble, and expense of locating the same porch swing if he hadn't loved and respected your grandmother. And you show great love and respect for both of them, as well as your great-grandfather, by your own actions and worries. If I may offer a suggestion... perhaps you can have a small plaque made with the details of the porch swing, as you have written here, and attach the plaque to the back or side of the swing. In that way, the history of the swing will live on regardless of who actually owns it. Someone with carpentry skill could also make a stand that would allow the swing to hang in a park or museum and would be a great legacy to share with you and your grandmother's community. Thank you for sharing this special piece of your family history.